There are four branches of Petite Abeille, or ‘Little Bee’ in New York City, each with Belgian charm and all proud of their reputation as being the providers of an excellent weekend brunch. Alas, house rules say no reservations are possible; you have to present yourself in person and be prepared to wait. Monsieur and I were in New York for a long weekend, late in March. We were lucky with the weather: the sky was nothing but high and blue, the air crisp and we couldn’t wait for a proper Noo Yoik Sunday brunch, so, armed with a pair of rumbling stomachs we headed down to lower Manhattan to the Petite Abeille at 134 West Broadway. On arrival there was already a line out the door, but within a few minutes we were inside and soon after that were offered seats at the bar while we waited for a table to become free. 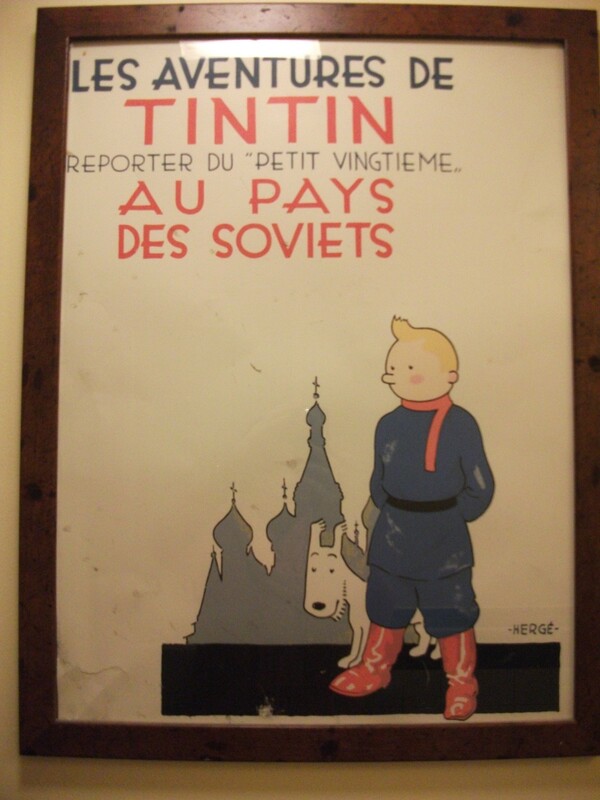 The restaurant byline is ‘a taste of Belgium’ and the walls were suitably covered with Tintin posters and a variety of Belgian memorabilia. We ordered drinks to quell our hunger. Monsieur had an OJ and I went all out, ordering one of the famous Petite Abeille Bloody Marys. This was one fantastic cocktail, with plenty of va-va-voom courtesy of oodles of fresh horseradish and a liberal dose of Worcestershire sauce. The usual celery stick garnish was enhanced by a sprinkling of colourful batons of capsicum, a bit like fat pick-up sticks. The success of this drink surely augured well for our brunch – if we ever got a table. Just as Monsieur’s stirrings of impatience became dangerous to the waitresses, we were ushered to a table by the window – one of the prime positions in this otherwise tiny shack of an eatery. The wait was worth it for our view of both our fellow patrons and the street of eclectic boutiques outside. There must have been a fun run that day because runners and their cheerleading friends and family started to descend on the Petite Abeille, wrapped in aluminium blankets. These sporty folk knew exactly where to get their post-exercise carb fix. Monsieur and I ventured into the menu with caution, nibbling at first on a shared almond croissant and a tartine of perfectly toasted baguette slathered with Nutella. My husband being French, his critique of breads is utterly unforgiving, so when he declared the baguette perfect and asked for a toaster like the one in the Petite Abeille kitchen, I was blown away. Such praise is rare. Around us, the meal of choice seemed to be the waffle special, loaded with blueberries, strawberries and rounds of fresh kiwifruit, all scattered atop an evil layer of whipped cream. This was obviously not the place for slimmers, as proven by a quick glance at the menu which features a lot of eggs, potatoes, burgers and cheese. With such a tempting selection I was torn; would I honour my penchant for croquettes (North Sea shrimp or Belgian Cheese), cave in to an Omelette Maison (smoked salmon, scallions and sour cream) or tuck into the vol au vent filled with chicken stew, bacon, mushrooms and accompanied by fries? 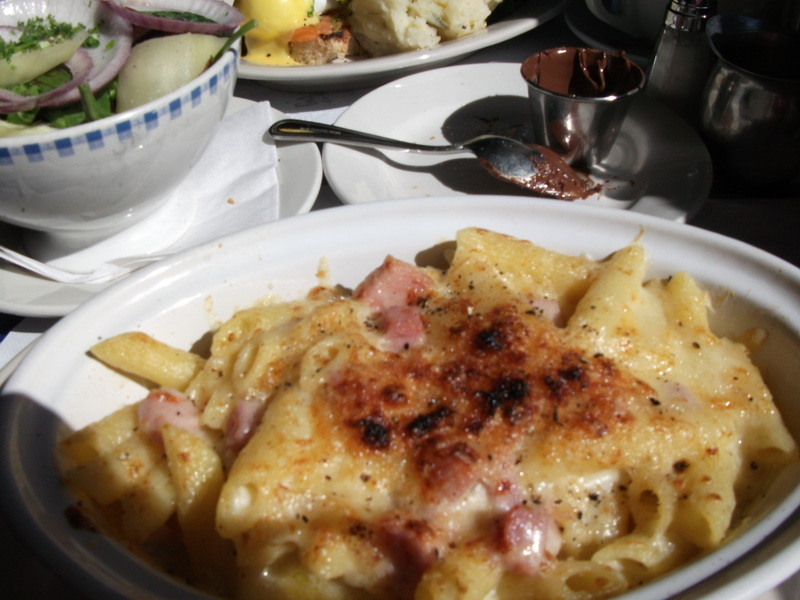 In the end I decided to go all out on the calorie front, ordering the Macaroni Jambon-Fromage – traditional mac ‘n’cheese with ham and Gruyère, delightfully gooey and rich with melted dairy products. Then to assuage the guilt attached to the glutton I am fully capable of being, I ordered a side salad of leaves with sliced red onion, seedless cucumber chunks and divinely marinated tomato that’s reminiscent of how tomatoey a tomato should taste. All of the time. Monsieur was now elbow deep in his brunch fare: eggs benedict with smoked salmon, mesclun salad and stoemp, golden yolky lava coursing across his plate. “Your eggs are better,” he pronounced, “but the muffins and smoked salmon are excellent.” Having started the day unconvinced by my choice of brunch restaurant, fussy French husband was now praising my eatery-selection techniques. “And this stoemp is very, very good.” he mumbled through a mouthful of leek and potato mash. The only thing he didn’t comment on was the mesclun, but he wouldn’t; to Monsieur salad is simply salad, only worthy of comment when the leaves are brown. Bottomless ice water and decent regular coffee with warm milk completed this sunny picture. We didn’t have room for any of the eight waffle options on offer but as a consolation, we would now not need lunch, having been fully topped up with calorific goodness. Monsieur and I paid our waitress with a smile, heading out into a bright Manhattan Sunday afternoon with gleeful step. I’ll certainly be back when the siren call of the North Sea shrimp croquettes becomes insistently inescapable and between you and me, I hope that might be soon. You are doing it again with all this food talk! You made it all sound extremely amazing: it was like I was there, but couldn’t describe it because my mouth was full. I’ll have the Eggs Benny! … and maybe a few sides of all the other stuff that’s on the menu.